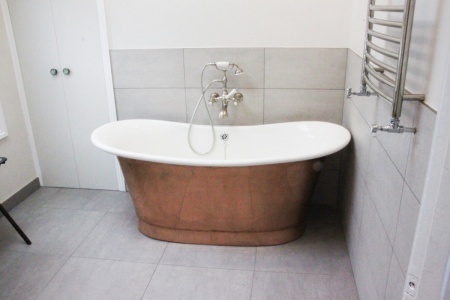 We have had quite a bit of work on our property in the last few years and the final project was to be our bathroom with the focus around a beautiful copper bath which has been sitting in the spare room waiting to be installed for nearly a year. We needed a company that could deliver a very high standard of work at a competitive price. Top building were not only very fair and competitive but wonderfully detailed in their approach both in quoting and their workmanship which is second to none. Vladimir and team understood the project from day one – made a few trips before hand which built the relationship and made myself and my husband very comfortable with our decision to instruct Top Building. What I enjoyed most is that Vladimir made great suggestions and offered money saving advice. Nothing was too much trouble and I really felt the team got behind the project. The knowledge and expertise is of an exceptional level. 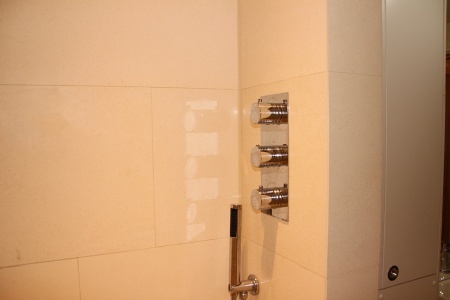 We had a few odd jobs that needed to be done which the team (Evo and Dimitri) welcomed and efficiently completed. I very much appreciate the patience and flexibility shown by the team and Vladimir’s brilliant way of keeping us informed every step of the way. Bathroom was totally refurbished including new walls, plastering, electrics, tiling and new boiler. It really has been a pleasure working with the team – I will most certainly be recommending them. Top Building were hired to fit a new bathroom and kitchen at our property, a 3 bedroom house. The job specification included removal of a wall and replacing a door frame with a stud wall to combine what had previously been a separate bathroom and WC. 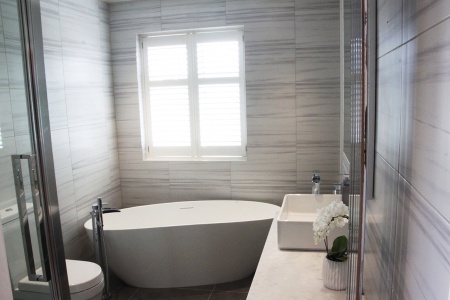 The specification also included a plaster skim to the kitchen and bathroom walls and ceilings; tiling of the kitchen and bathroom floors and partial tiling of kitchen and bathroom walls. Top Building provided a detailed and fully itemised quote for the job, which was one of the most competitive quotes we received, and began work within a few days of having their quote accepted. They were fully focused on the finishing the job during the two and a half weeks that they were at our property and all the jobs they were hired to do at the property were completed to a high standard and with attention to quality, neatness and detail. The Top Building Team were always polite, considerate and friendly and they always left the house clean and tidy. The Top Building Team kept us informed on how the job was progressing and made sure that all details of the job were being carried to our preference and specification. On a number of occasions they provided valuable suggestions to improve design and aesthetic elements or to remedy practical difficulties. We are very pleased with the work that we have had done on our property by Top Building and we would certainly hire them again. I am very pleased with the standard of the work, and with the commitment and dedication of the three who did the external decorating. They worked hard and finished the job within 3 days. Thank you very much. Excellent service, the attention to detail is extremely impressive. They were full of great ideas and advice and have installed an amazing bathroom. They are friendly, reliable and tidy and I would highly recommend them. I couldn't be happier. Vladimir and his team refreshed my bathroom- re-tiled the walls and floor and painted the ceiling and window. I was surprised to see the level of detail they went to when quoting, which was much more rigorous than other tradesman who did for the same job. They were very punctual, worked quickly and to a high standard and kept tidy throughout and left our house clean afterwards. Vladimir was also very good at communicating with us and they were all polite and friendly. Vlad did a great job on my bathroom. He was very helpful in advising best ways of completing the job and did all the work in good time. He was very clean and tidied up each day when he left so we could use the space. He was very accommodating in how he went about the work so as to cause as little disruption to us as possible. He also prepped and painted the hallway walls and stairs. A good job all round. His price was reasonable too. I would definitely use him again.